I am not sure what to say. This was an enjoyable book. It wasn't what I expected but it fell into my lap right when I needed something to divert my attention. That's kind of my M.O. I had a million things that were happening that were beyond my control so I did the one thing that I could control--read. And I basically read it overnight. Admittedly, it has been awhile since I read any Nicholas Sparks. He's a wonderful author and my girls really enjoy reading him. I really enjoyed his early writing, but he'd gotten a little predictable and what I call cookie cutter in his writing. Which happens to all of us in our lives--we get predictable and cookie cutter--and we have to step back and examine our lives. Not the easiest thing to do, but sometimes stuff just slams you and you have to frost your cookies the best you know how and move along. Safe Haven is almost a mystery. The main character has a history (who doesn't) and when she lands in a small town reinvents herself. As the story rolls along, more and more of Katie is revealed and I began to kind of freak out. The dreaded 'What if...." game took over and I had thoughts of 'what if that were my daughter' and 'how can someone just be an orphan'? Somebody should have helped this girl. It did bring the whole 'everyone is fighting some sort of battle so be kinder than necessary' back into my daily thoughts. Who knows what each of us is up against? Somewhere there is a wife afraid for 5 o'clock to arrive because that means her husband is on his way home...hoping her dinner is good enough and the house is clean enough and trying to keep it together so she won't get beat again tonight. And somewhere else there's a grandma dying of cancer while her children and grandchildren stand by helplessly wondering what they can do to make this whole thing easier on Grandma. And somewhere there's a 9-year-old wondering what she's going to fix for supper tonight knowing that her brother and sister need something to eat. 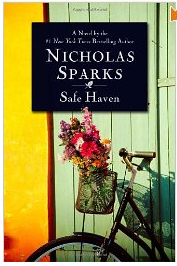 When I started reading Safe Haven, I thought I was getting fluff and what I took away was much deeper. Just sayin'.